So Many LEGOS, So Little Time. As an artist I have always appreciated the palate of primary colors which is why I delight in activities which include LEGOS. To me and apparently many others, primary colors represent fun. My interest in LEGO related activities has increased with the enthusiasm shown by my three-year-old grandson. LEGOLand Earth Quake Zone table presents colorful interactive challenges with plenty of creative choices. While we have been assembling Duplo creations for months on the living room floor, I have never had the opportunity to share an official LEGOLand experience with him. 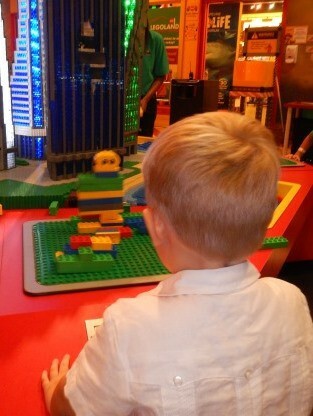 That changed last week when we shared our first LEGOLand Dallas mini adventure. Our first experience happened at LEGOLand Dallas where colorfully organized chaos and immersive activities result in remarkable moments of concentration and plenty of happy faces. I found a colorful mix of LEGO assembly tables and stations mixed with Kingdom Quest, Merlin’s Apprentice LEGO ride, and at the heart of the facility is a netted climb and scramble zone – LEGO® City Play Zone & Fire Academy plus a terrific Pirate Beach. Combine LEGOS, water spouts, slippery slides and sunshine at Pirate Beach part of LEGOLand Dallas. Our first four-hour experience was stimulating and most enjoyable. With all of the tempting activities I am certain that no two experiences will ever match. Now LEGO adventures are pinned to my vacation radar screen because tiny adventures have the potential for mega fun. It seems LEGO experiences abound on the planet. Imagine seeing a polar bear and her cubs made of LEGOS. How about an American bison with calf? They are all waiting to be discovered at Denver Zoo where artful sculptures decorate the pathways with primary colors. 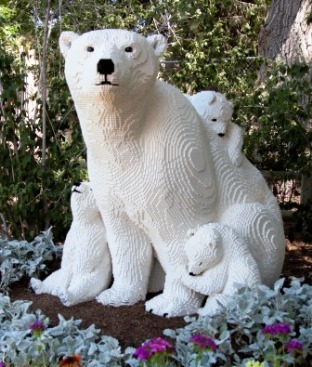 Imagine seeing a polar bear and her cubs made of LEGOS at the Denver Zoo. During Labor Day weekend there’s KidFest and the LEGO Creativity Tour in Austin, Texas. The interactive LEGO® extravaganza brings all of the creative hands-on, minds-on fun of LEGO building together in an activity and entertainment-packed family event for children of all ages. There is an awesome LEGO dream park in Florida. Like its European cousins and California sister, the park celebrates primary colors with all things LEGO®. Like other LEGOLand Parks the Winter Haven location is divided into 10 fun-filled, interactive zones plus four junior coasters. The world’s largest LEGO Christmas tree is at LEGOLand in Southern California. The tree in Holiday Fun Town stands more than 30 feet tall and is more made of more than 245,000 forest green DUPLO® bricks, surrounded by packages and LEGO friends. To make a solid plan all you have to do is connect the bricks.